The collect and readings for the Third Sunday after Epiphany, Year B, may be found here. The following sermon is based on the gospel, Mark 1:14-20. Simon and Andrew were casting a net into the sea for they were fishermen. Day after day it was the same thing; the same sea, the same net, the same boat. Day after day it was wind, water, fish, sore muscles, tired bodies. They probably grew up watching their dad and granddad fishing, watching their future life, watching how they too would spend their time. Cast the net, pull it in. Cast the net, pull it in. If you are not casting the net, then you sit in the boat mending the net. That’s what James and John were doing. Casting and mending. Casting and mending. You know about those days, right? We may not fish for a living but we know about casting and mending nets. Days that all seem the same. One looks like another. Life is routine, lived on autopilot. Nothing changes. We don’t expect much to happen. This is our life. We cast the nets. We mend the nets. Casting and mending to make a living, to feed our family, to pay the bills. Casting and mending to gain security and get to retirement. Casting and mending to hold our family together, to make our marriage work, to grow up our children. Casting and mending to gain the things we want; a house, a car, books, clothes, a vacation. Casting and mending to earn a reputation, gain approval, establish status. Casting and mending our way through another day of loneliness, sadness, or illness. Casting and mending are realities of life. They are also the circumstances in which Jesus comes to us, the context in which we hear the call to new life, and the place where we are changed and the ordinary becomes the extraordinary. These would be disciples, Simon and Andrew, James and John, are not looking for Jesus. They are too busy with the nets. It is another day of casting and mending. They may not have even noticed Jesus but he not only sees them he speaks to them. 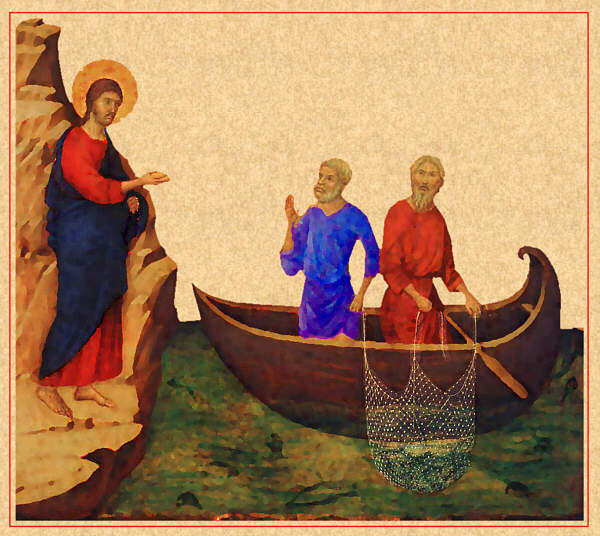 Jesus has a way of showing up in the ordinary places of life and interrupting the daily routines of casting and mending nets. That’s what he did to the lives of Simon and Andrew, James and John. That’s what he does to your life and my life. “Follow me” is Jesus’ invitation to a new life. If these four fishermen accept the invitation, their lives will forever be different. They will be different. They will no longer catch just fish. They will fish for people. Whatever your life is, however you spend your time, there is in that life Jesus’ call to “Follow me.” “Follow me” is the call to participate with God in God’s own saving work. It’s the work of change and growth. That work is always about moving to a larger vision, orienting our life in a new direction, and experiencing that our little story of life is connected to and a part of a much larger story of life, God’s life. The invitation, “follow me,” is also the invitation to leave behind; to leave behind our nets, our boats, and even our fathers. That’s the hard part for most of us. We’re pretty good at accumulating and clinging but not so good at letting go. More often than not our spiritual growth involves some kind of letting go. We never get anywhere new as long as we’re unwilling to leave where we are. We accept Jesus’ invitation to follow, not by packing up, but by letting go. “Follow me” is both the invitation to and the promise of new life. So what are the nets that entangle us? What are the little boats that contain our life? Who are the fathers from whom we seek identity, value, or approval? What do we need to let go of and leave behind so that we might follow him? Please don’t think this is simply about changing careers, disowning our family, or moving to a new town. It is about the freedom to be fully human and in so being discover God’s divinity within us. We let go so that our life may be reoriented, so that we can now travel in new direction, so that we may be open to receive the life of God anew. When we let go, everything is transformed – including our nets, boats, and fathers. That’s why Jesus could tell them they would still be fishermen. But now they would fish for people. They wouldn’t become something they weren’t already, but they would be changed. They would become transformed fishermen. They would more authentically be who they already were. Ultimately, it’s about letting go of our own little life so that we can receive God’s life. This letting go happens in the context of our everyday activities; work, school, families, paying the bills, running errands, fixing dinner, relationships, and trying to do the right thing. It happens in the casting and mending of our nets. These are the times and places Jesus shows up and calls into a new way of being and our world changes. It happened for Simon, Andrew, James, and John. It can happen for you and me. Loved your words. I often think of the people I’ve travelled with over the years. Most of them stayed in that “casting and mending” mode of living. They never really moved out of it in to something greatly adventurous But I think many of them, I hope, began to look at the mundane, every day casting and mending of nets with new eyes and found meaning in it all – as you say, seeing it in the perspective of the greater story. I’m always touched by the way Jesus moved among the mundane and kind of infused it with meaning. I wonder if following him has a lot to do with this. Thanks again Mike.Lovely insights. Don, I hear in your description the sacramental life, finding the holy in the mundane. I think of how the sacraments begin with the everyday stuff – bread, wine, water, touch, oil – and reveal the sacred. I wonder how many times I have missed the holy by taking for granted the ordinary. I like that Mike – a kind of a Brother Lawrence spirituality. He stayed with the mundane – casting and mending – but found tremendous meaning there. You are talking about a subject of great interest to me: finding God in our daily work. 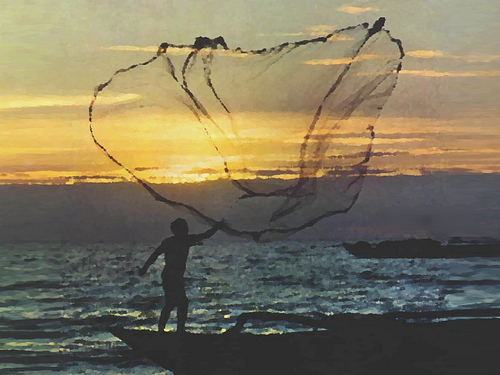 Many of us would gladly leave our nets (or whatever we work with) and follow Jesus, but you have shown us that the way for us to follow him today is to be transformed within our work settings. That’s a difficult thing to do. Thank you for challenging us to accept that calling. Ron, you are right. “Finding God in our daily work” is a difficult thing to do, maybe some of the hardest work we do. To even do this work suggests, I think, that we believe and trust that all of life and creation are sacramental. Too often we want faith to be an escape from the world when in truth it is the means by which we engage the world. Thanks for your comment and for reading my blog. Blessings on your journey of discovering God in your daily work.